The coal vase shown by Figs. 414 to 416 should be made in oak. The two sides must be got out first, these being of f-in. full board when finished. They are cut to the shape shown by Fig. 415, the above the extreme top point of the sides. It is cut 1 ft. Î in. long by 10 in. wide, f in. at each end being dovetailed on the under side to fit the grooves. The front edge is planed to a bevel ; the back edge comes to the corner of the rebate. The bottom, of ¿-in. board, is 1 ft. f in. long by 1 ft. 3 in. extreme measurement being 1 ft. 5 in. long by 1 ft. 1 in. high. 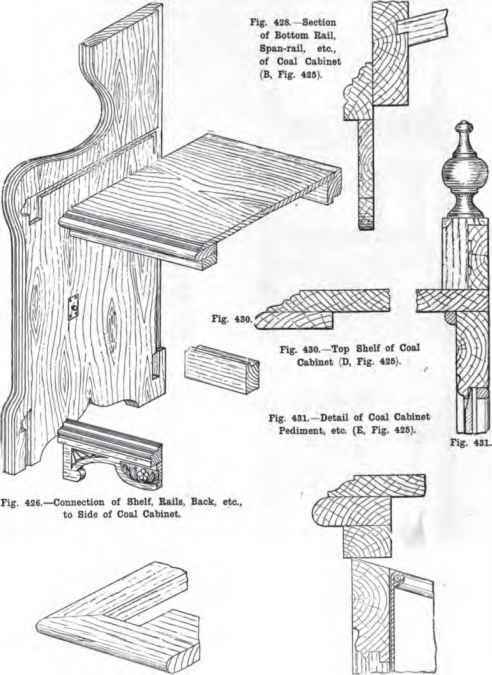 They are then grooved half-dovetail and rebated on the back edge, as shown by Fig. 417. The back and bottom are of ¿-in. board, and the rebate and bottom groove should be made accordingly. The top is of f-in. board, which should not be more than 2 in. wide, the length being measured along the grain; it is then treated the same as the top. When this is done, the pieces are slid in place in the grooves, using glue, which must be hot and not too thick. See that the bottom is not out of square; then stand it upside down and glue four blocks at the corners as at Fig. 416. 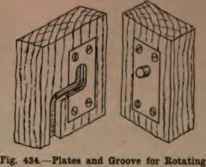 420.— Strap Hinge for Coal Vase. 418.— Section of Coal Vase Pediment. Fig. 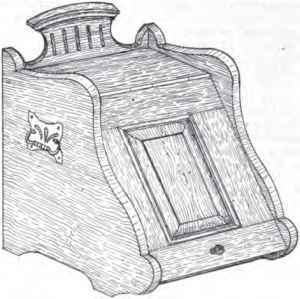 419.-Section of Coal Vase Lid. Figs. 421 and 422.—Shovel Holder for Coal Vase. are then worked on the front with a f-in. gouge, and a piece of 1-in. by f-in. 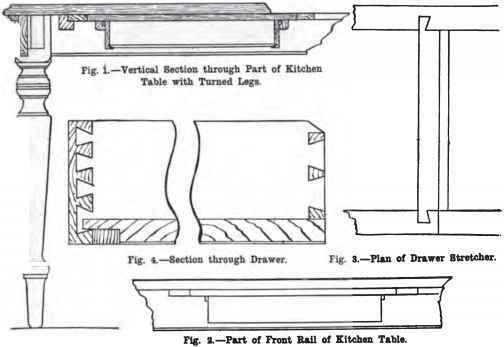 curved ogee moulding is put on top, as shown in section by Fig. 418. The back is then fixed in place with screws to the sides, bottom, and top. The foot piece at the front measures 1 ft. long by 3| in. wide by f in. thick. 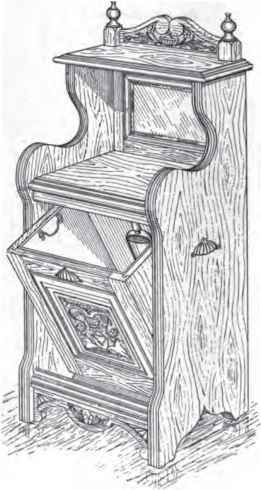 It is neatly fitted and secured by two sprigs through each of the sides, and to the front edge of the bottom, glue being also used. The sprigs should be punched below the surface, the holes being filled with a stopping to match the wood. 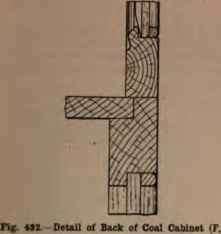 Figs 424 and 425.—Front Elevation and Cross Section of Coal Cabinet. am »imply of board, the grain running vertically, with a narrow clamp at each end tn prevent warping. The coal vase is now ready for polishing. 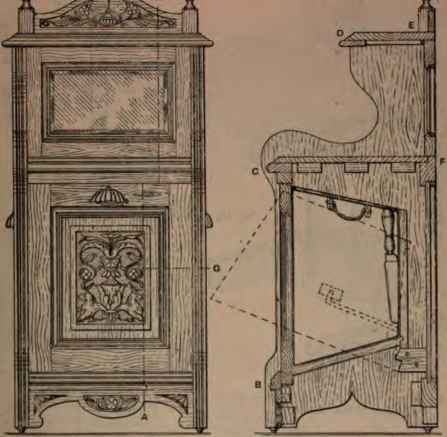 When this is dune, add the liftings, including two handles for th« side*, the lunges, and the brass knob towards the lower edge of the lid. easily hammered to the shape shown, and. wheu properly polished and lacquered, is screwed to the back. 5 in. from the floor. This holder keeps the shovel handy, though out of sight (see Fig. U5). A lining of galvanised sheet-iron should be made; but this, of course, is certainly a job for the sheet-metal worker. at H, c, 1». K and r respectively are shown by Figs. 428 to 432. An enlarged part horizontal section on the line a (Fig. 424) is presented by Fig. 433. The arrangement (already referred to) of supporting the coal box on pivots is illustrated by Fig. 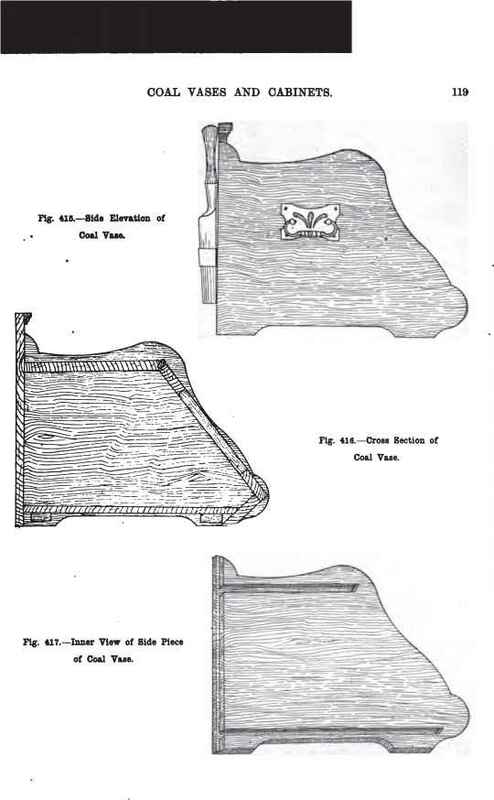 434, the actual coal t>ox of iron, without its wooden container, being shown by Fig. 435.